Generally speaking, I wouldn’t consider myself a method writer. I believe I can write a believable decapitation scene without decapitating anyone myself. Or, at least, I can trust that most readers lack sufficient murder experience to be able to call out any inaccuracies. So learning the basics of woodworking was a departure for me. My soon-to-be-published novella features an instance of what I’m going to call ‘seductive woodworking’. One character builds a table to impress another character. In the interests of making this scene being reasonably believable, I went out and learned woodwork skills. And today, I share this knowledge with you! I’m of the opinion that you can never have too many bookshelves. This is possibly because I own too many books. Unfortunately, I don’t have an infinite bookshelf budget/that much floor space. With these limitations in mind, here’s how I went about making a no-fuss wall shelf with very cheap materials. This shelf is not difficult to make and, provided you have some basic tools, is very accessible for beginners. Similar shelves in smaller sizes sell on Amazon for a minimum of $42. 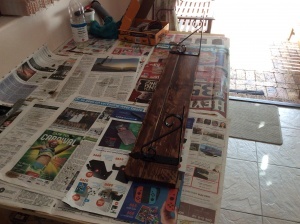 I estimate that making this shelf yourself will cost around $20 ($6 for wood, $1 for screws, $5 for brackets, $7 for wood stain and polywax, $1 for sundries). However, I’m basing this on the cost of materials in South Africa converted into US Dollars, so my numbers might be off. *I take no responsibility for what happens if you try to hang this thing on drywall. 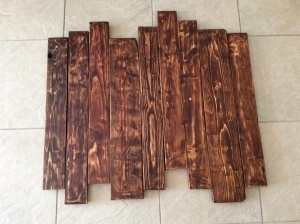 Select your desired pallet wood planks. 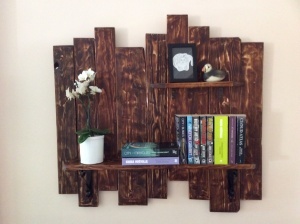 The cool thing about pallet wood is that it’s ridiculously cheap. 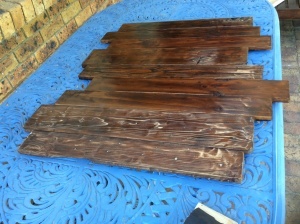 I paid roughly R7 a plank (about $0.50), and selected planks of varying widths for aesthetic effect. 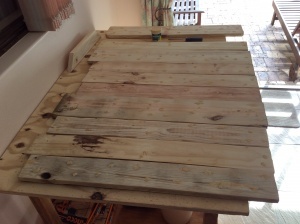 You will want at least one plank that’s 140mm wide – this will serve as the actual shelf. Do you have a lot of rage? Do you want to smash things? Then I have a job for you! 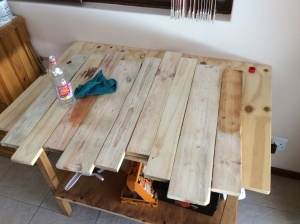 Pallet wood is cheap for a reason. It’s a hot mess. During its previous life, this wood will have been attacked by every kind of nail and screw and staple, and these metals will still be imbedded in the planks. You’re going to need to get them out. Leaving metal inside the planks is not ideal for a couple of reasons. First, it can rot the wood, which will weaken it. Secondly, you might accidentally drill, sand, or saw into it later. It’s fine if one or two particularly stubborn nails refuse to be removed, but try to remove as much metal as possible. Place the nail punch over the offending nail and whack it repeatedly with the hammer. With sufficient force, the nail should come out the other side. To prevent breakout (splintering), you may want to perform this task on top of piece of scrap wood. Don’t worry if you make a mess. That’s what wood filler is for. Time to break out the angle grinder. Pallet wood surfaces are going to be rough, marred by paint or oil, and feature exciting new dings courtesy of a poorly aimed hammer. Like removing the glasses from a Hollywood romantic lead, smoothing away these imperfections will reveal the beauty that was there all along. 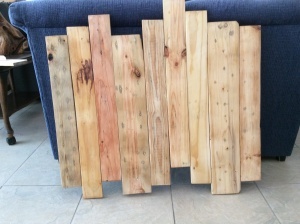 Raw pallet wood. No one said it was pretty. If you have a sanding machine, this step will probably be a breeze for you. I don’t have a belt or orbital sander, but I do have an angle grinder. To my satisfaction, I discovered that you can fit a sanding disk (known as a ‘flap disk’) onto it, which works very well and is cost-effective. Theoretically, you can also sand all your planks by hand, but I wouldn’t recommend it at this stage, unless you aspire to become a bodybuilder. Smooth all the sides of the planks that will be visible. Try to be tidy, but don’t worry if there are small gouges and valleys. They will add interest to the final product. Call it rustic charm. Fill in the holes you created with the nail punch using wood filler. It can be applied quite nicely using a flat-head screwdriver. Leave the wood filler to dry. Copious wood filler can fix all manner of problems. Using a reasonably course sandpaper, remove the rough edges of the wood filler. This will be a very dusty exercise, and I’d recommend a face mask so that you don’t breathe too much of the stuff. Lay the planks out on the ground. This bit’s quite fun. Arrange the planks in a way that you find pleasing, experimenting with different sequences. Make sure, however, that you put two of the sturdiest-looking planks in line with where you want to attach the large brackets. Because these planks will bear the weight of your literature, you don’t want to select weaker pieces here. Mark the placement of the planks in pencil or chalk. 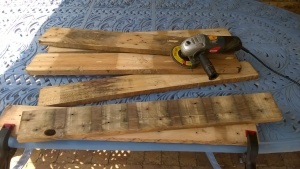 If, like me, you want to stagger the heights of the planks in your backing board, I’d suggest putting the smallest planks on each side as a frame. Using a jigsaw, I shortened two of my planks for this purpose. I’d also recommend fully committing to the staggering. A slight stagger can look drunk and unintentional. Stagger like you mean it. Let’s make the backing board. Flip your planks over to their ugly side, and line them up correctly. Place your pine strips lengthways across the planks. Bear in mind that you want to place the strips at the height of your shelves, because it will give your brackets more to anchor onto. Ensure that the strips are perfectly straight using a spirit level. This is very important, so do your absolute best to be accurate. If you go skew, your shelf will hang at an angle. This will leave you with Not A Shelf but an Avant Garde Wall Hanging. 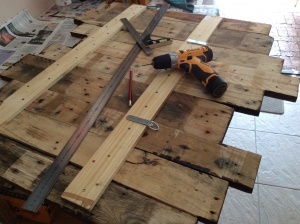 Drill two pilot holes per plank, through the pine strip and into the pallet wood. Don’t drill through the far side of the pallet wood though, or you’ll be reaching for the wood filler again. Then insert the screws and tighten them. Repeat for the second pine strip. Artfully staggered and ready to go. Clean down all the planks with mineral turpentine. Getting high on turps fumes is half the fun. 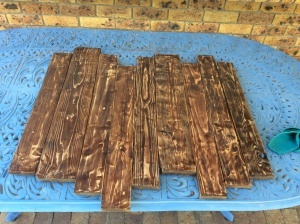 Mix your Woodoc and wood stain. My shelf ended up much darker than originally envisioned because I was a little heavy handed with the stain. Apply a generous coat of the mixture to your backing board and shelves. Leave to dry overnight. The stain will soak down to different depths depending on the grain of your wood, and how wild you were during the sanding process. Whoops, now it is very dark. Hand sand your workpieces. You’ll take off the top layers of the stain, creating glowing ghostly patterns. Remember to sand with the grain of the wood, or you’ll create noticeable scratches. Once you’re happy with the sanding, clean everything with mineral turpentine. Colourful, but not really what I’m going for. 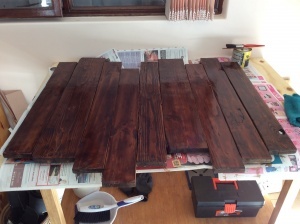 Apply a second coat of stain, but a thinner layer this time. As before, leave to dry. Clean with turpentine. More sanding. This time, use fine steel wool to create a smooth, glossy appearance. The wood should really be taking shape now, and will no longer look like the cheap, terrible nonsense you started with. Stain again, dry again, turps again. And more sanding. You can continue using steel wool or, for an extra fine finish, switch to cabinet paper. You’re probably tired of sanding and staining now. We will move on to the final assembly. The first stage will be to attach your strap hangers. Measure the brick wall where you plan to place your shelf, and mark halfway with a pencil. From there, make two equidistant marks where you intend to drill the screws that will hold your strap hangers. Needless to say, the screws you drill into the wall are going to need to be very strong. Before drilling, make sure your marks are perfectly level. This is critical. Use the spirit level again, because there is no guarantee that your wall itself is straight. Once you are certain the marks are in the correct places, drill and insert your screws. Measure, and measure, and measure, and repeat. Return to the backboard. Using the exact same distance that exists between the two holes in your wall, attach the strap hangers to the top pine strip. You now have a hang-able backboard. Place your larger shelf in line with the lower pine strip. Is it level? Make it even more level. Measure it a fifth time. Fancy twirly brackets are live. Attach the large brackets first to the shelf, and then to the backing board. Repeat the process for the smaller top shelf, this time using your smaller L-brackets. I painted my L-brackets brown, because they were a little shiny for my taste. Hang up your finished shelf. Artfully select books to arrange on top of it. Flowers? Flowers are good. Do you have any cute knickknacks for the top shelf? Plunk those suckers down. And there you have it. A very nice shelf. If you try to make this shelf, I’d love to see your results. Make alterations, improve on this design! Share pictures here! Additionally, a very cool thing you could do is preorder my book. Can I just say that it would look great on your hypothetical shelves? Authentic depictions of seductive woodworking, guys. I know you are curious.